Being in a counseling group can be a unique experience generating both excitement and anxiety. Below, we provide an overview of the procedures for joining our groups and some other helpful information. In the first step, you would meet individually with one of our intake counselors. This meeting is designed to assess whether the groups would be beneficial to you and to allow you to ask any questions you might have before beginning. Prior to joining a group, you would meet individually with the co-leaders in a pre-group screening session. In this session, the co-leaders assess whether the group would be a good fit for you (and vice versa), provide information about the specific group, and answer questions you might have. Once you are assigned to a particular group, you are ready to start. We have found that coming to the group for the first time can be the single hardest step. After the initial session, however, most people look forward to coming and miss very few sessions. We suspect that you will as well. 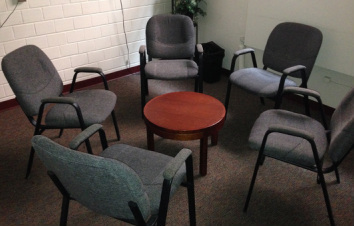 In our counseling groups we encourage everyone to share their experiences, concerns, and unique perspectives. However, people do this at their own pace. No one is required to share; each member has the right to share what and when they want. We often spend time talking about current concerns, past problems, and solutions for the future. We also spend time talking about what is occurring in the group itself. We might talk about similarities with each other, reactions to what others say, or simply how it feels to be in the group. Past group members have shared with us that being in a group is a very powerful and helpful experience. They report that hearing how others struggle with the same concerns helps them feel supported and limits the isolation and loneliness that can come with personal problems. They report that being in the group allows them to talk about things in their lives that very few people know about. They also value getting feedback from other peers, not just professional counselors. Also, group is a wonderful place to practice new behaviors, get interpersonal feedback, and hear how others have overcome their problems.